PRINCETON, NJ -- Americans' trust and confidence in the federal government's ability to handle international problems has reached an all-time low, with 49% saying they have a great deal or a fair amount of confidence, two percentage points below the previous low of 51% recorded in 2007. These new data come from Gallup's annual Governance survey, conducted Sept. 5-8, 2013, while Congress was debating the use of military force in Syria, but prior to President Barack Obama's nationally televised address on Syria, and Russia's proposal to avert U.S. military action. Between 57% and 66% of Americans said they had a great deal or a fair amount of confidence in the U.S. government to handle international problems during Obama's first term. This represents a generally higher level of confidence than Americans expressed during the latter years of the Bush administration, when the U.S. was engaged in protracted wars in Iraq and Afghanistan. The historical high point on this measure (83%) came in October 2001, shortly after the 9/11 terrorist attacks. Americans also expressed high levels of confidence in the government on international matters in 1972 and 1974, when the question was first asked, even as the controversial Vietnam War was drawing to a close. 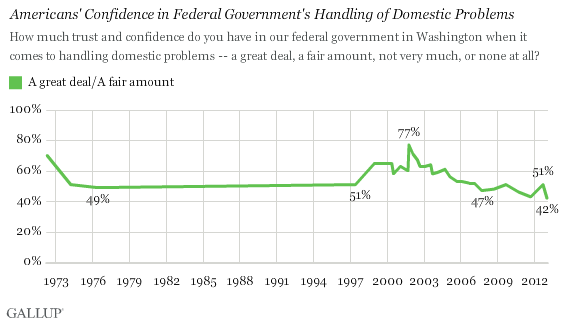 Americans in the same survey also expressed historically low levels of confidence in the federal government's ability to handle domestic problems, with 42% reporting a great deal or a fair amount of confidence. This is one point below the previous low of 43% in 2011. 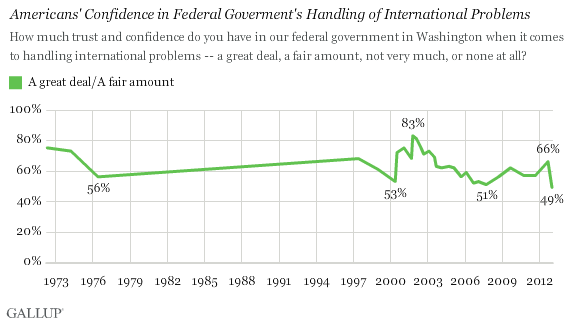 Americans' confidence in the federal government on domestic problems, as was true for international issues, peaked in the October post-9/11 poll, when 77% expressed confidence. Confidence then trended downward throughout the 2000s, and has sunk to several new lows since 2010. The exception is last year's 51% reading, taken in the days after the Democratic National Convention, which helped fuel more positive feelings about the president and government more generally. Democrats are more likely than Republicans and independents to be confident in the federal government's ability to handle international and domestic problems. Democrats' confidence on international problems is still relatively strong compared with 2009 levels, but their trust on domestic problems has fallen by 16 points. Confidence has eroded on both measures among independents and Republicans. Democrats expressed especially high levels of trust in 2009, with 78% feeling confident in the government's ability to handle international problems, and 74% expressing high confidence on domestic problems. A majority of independents and Republicans expressed confidence on international problems, but no more than four in 10 were confident on domestic ones. Partisans have historically answered these confidence questions based on their evaluations of the party holding the presidency. In 2007, during the Bush administration, 81% of Republicans had a great deal or fair amount of confidence in the federal government on international problems, and 66% of Republicans expressed trust on domestic problems, while Democrats and independents expressed much lower confidence on each. Americans' trust and confidence in the federal government's ability to solve problems internationally as well as domestically has fallen to historic lows this year. There are a number of possible explanations for this loss of confidence: controversy surrounding potential U.S. action in Syria, an enduring low assessment of the state of the economy, or low levels of confidence in Congress. Results for this Gallup poll are based on telephone interviews conducted Sept. 5-8, 2013, on the annual Gallup Governance survey, with a random sample of 1,510 adults, aged 18 and older, living in all 50 U.S. states and the District of Columbia. For results based on the total sample of national adults, one can say with 95% confidence that the margin of sampling error is ±3 percentage points. Five years after Lehman Brothers declared bankruptcy, U.S. consumers express more positive views about the U.S. economy and the job market broadly; but their spending and confidence in their jobs remain below pre-Lehman levels. Americans' ratings of several industries improved this year, including the recession-ravaged banking and real estate sectors. Ratings of the healthcare industry have declined most. Computers are still the best rated and oil the worst. In the U.S., 64% would not like to see their child go into politics as a career, with the results the same for "sons" vs. "daughters." Americans are more likely to favor political careers when asked about daughters first.